QSound’s family of audio enhancement ICs deliver a variety of analog processor solutions for OEM consumer electronic devices without a programmable DSP. 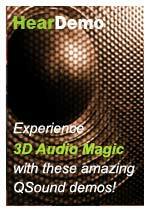 QSound’s sonic technologies, algorithms and special effects include 3D audio, multi-speaker system surround synthesis, virtual surround, and 3D sound stage expansion. As a global supplier of audio software technology, QSound algorithms are delivered for a wide range of devices and applications including stereos, televisions, speakers, home theater, computers, video games, headphones, Bluetooth headsets and other consumer electronics. QSound’s proprietary audio algorithms truly deliver a fuller, more natural and immersive audio experience - users hear the difference!! The QS7777 is a 3D audio processor IC using QSound’s patented QSurround® technology for multi-channel surround. This chip processes decoded Dolby Digital (AC-3), Dolby Surround or other multi-channel formats and produces virtualized 3D sound for two speaker systems. In addition, various combinations of virtualization and sound field enhancement are employed to provide 3, 4 and 5 speaker systems with maximum spatial rendering effectiveness. The QS7779 is an audio processor IC that implements a decoder for a stereo matrix encoded source material such as Dolby Surround, along with surround virtualization using QSurround® technology developed by QSound Labs. This chip also produces an enhanced stereo sound field for a stereo input signal. If the input signal contains matrix encoded surround sound, the chip automatically decodes it and produces virtualized surround sounds for two-speaker playback. The QS7785 is a 3D audio processor that creates 5 speaker surround sound from 2 channel stereo source using QSound’s proprietary QSurround® technology. This chip synthesizes and outputs surround sounds from 2 channel stereo signal for surround speakers as well as an enhanced stereo sound for front speakers. Audio solutions by QSound Labs have been rigorously optimized with the participation of major industry partners focusing on three critical requirements: quality, processing performance and memory footprint. For detailed technical information and implementation data please contact a QSound representative or email us at info@qsound.com.